Gorenje and Zlatarna Celje (Celje Goldsmiths) for the second time participate in the charitable project of the Croatian branch of Europa Donna, the European association for breast cancer care. For the occasion Gorenje once again manufactured the pink retro-look refrigerator Old Timer, and Zlatarna Celje contributed the glittering jewelry – white gold encrusted breast cancer care ribbon which will be auctioned along with other two Zlatarna Celje silver ribbons at the charitable event to be held on 19 November 2008 in hotel Atrium in Split. 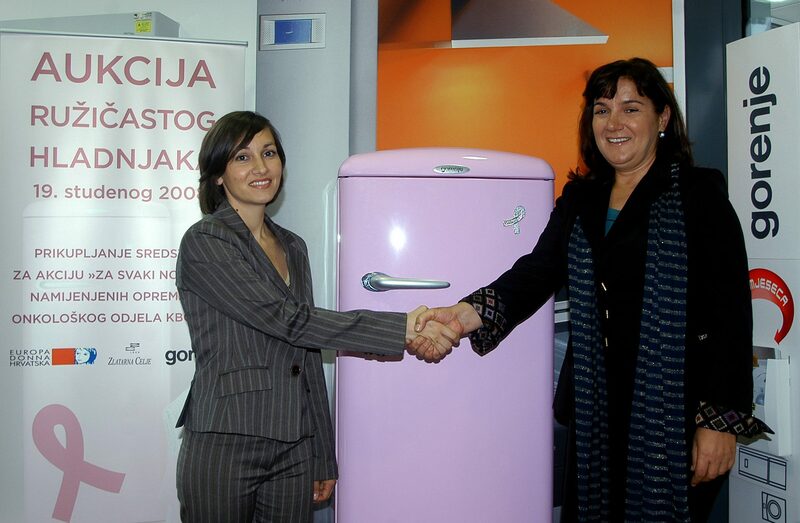 Ms. Smiljana Rađa, regional representative of the Europa Donna Croatia today ceremonially accepted the pink fridge and two silver ribbons, delivered by the representatives of Gorenje and Zlatarna Celje. The entire funds raised at the auction will be used for furnishing the oncology department of the Clinical Hospital KBC Split. »Europa Donna has been trying to raise awareness of Croatian public in regard to the importance of promoting active fight against breast cancer, which has been claiming increasing number of female victims each year. Today's example of charitable actions of Gorenje and Zlatarna Celje proves that corporate sector can largely contribute to such efforts. We believe in the success of this joint action, and we hope that this will be a great motivation for other similar projects« said Ms. Smiljana Rađa, regional representative of the Europa Donna association from Split on the occasion of ceremonial reception of the pink fridge and silver ribbons. Gorenje not only participates in various charity projects, but also organizes its own charitable events, so far having concluded numerous successful humanitarian projects. This way Gorenje demonstrates that it is not only the company with rich business tradition, but also a company with developed sense of social awareness..
»With a similar action held in collaboration with the Europa Donna Coratia in April this year we raised 111,000 Croatian kuna for the acquisition of mammography apparatus for the General Hospital in Varaždin. So far within the similar projects 5 top model fridges embellished with Swarovski crystals have been manufactures exclusively for charity fund-raisers which collected a total of over 150 thousand EUR. Cooperation between the Europa Donna association, Gorenje and Zlatarna Celje had started last year in Slovenia with the fund raising action for the purchase of CT scanner for the General Hospital in Celje. I believe that our second joint auction in Zagreb will also give significant contribution to the fight against breast cancer« said Ms. Simona Štern, Marketing Director of Gorenje Zagreb. So far four pink fridges have been manufactured and embellished with golden jewelry in form of glittering ribbon, fabricated in Zlatarna Celje (Celje Goldsmiths), the partner of Gorenje in actions promoting the fight against breast cancer. Both companies intend to continue collaboration with the Europa Donna association in the future in other European countries with Europa Donna regional branches. They are convinced that autions involving pink fridges will trigger numerous decent and aware individuals and companies who are willing to donate a portion of their finances for the noble cause. This is at the same time the basic guidance in preparing the pink fridge projects, for which the initiative originally came from the Europa Donna Association.